Our Wild SNL team v Paisley Pirates. After the frenzy of the away leg last Sunday night which ended in a 4-4 draw this tie was shaping up to be a classic. With both sides needing a win to secure their route to the final against the east coast league winners. With some key players missing for the Wild they would need to rely on the depth and strength of the squad to see off the challenge of a strong Pirates team. From the first puck drop each side trying to gain the upper hand. It would come however from a Pirates power play after Wilds Alan Maitland receive a penalty for tripping timed at 1:45. Chris Turley scored to give Paisley the lead timed at 2:56. This only fuelled the determination of the home side to take the game to Pirates. Leading to a fast pace were every puck was contested by both teams. Using the high tempo, the Wild tried to get a foot hold in the game before the end of the first period, however the period finished with the Pirates still holding on to a slim lead of 1 goal. The second period continued with the Wild pushing trying expose the weakness in the Pirates defence. Again, it would be the visitors that would strike from a power play when Gary Sherriff was given a minor penalty for an interference call timed at 26:10. Former North Ayrshire junior player Dean Hamilton, scored for the Pirates late in the penalty kill to double the visitors lead, goal time 28:03. Midway through the second period, the tensions of the game came to a head at 35:03 when the Wilds Adam Kerr and Pirates Ben Walker were each given 2+2 for roughing. This wouldn’t be the end of the drama for this period as the Wild’s Callum Siebenaler got involved with Pirates Chris Turley which saw Siebenaler being put out the game by officials and Turley receiving 2+2 for roughing time of penalties 36:49. The second period ended with the Pirates holding onto a 2-0 lead. The third saw the Wild come out with a new self-belief which showed in their play as took the game by the scruff of the neck and too it to the Pirates. It wasn’t long till they scored through Scott Cowan assisted by Ryan Campbell timed at 43:55. The Pirates however were determined to hold on to increase their lead through Calum Blair assisted by Euan Mclaughlin at 45:24. The Wild answered back almost immediately through Alan Maitland assisted by Scott Cowan and Lewis Smith goal score at 46:14. Paisley would increase their lead again at 51:01 through Richard Thorp assisted by Martyn Guy. The Wild were not finish yet and pulled one back again through Alan Maitland assisted by Scott Crane timed at 58:54. 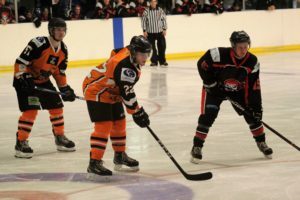 With the score at 4-3 pirates going into the final minute the Wild needed a goal and it came via Alan Maitland for his hat trick assisted by Alasdair Brown and Scott Cowan goal time 59:19. For the second week in a row the game finished 4-4. Wild man of the match Alan Maitland. At Ayr Ice Rink: Face Off – 5pm. We also have 2 girls attending The Scotland girls development session being held at The Time Capsule in Coatbridge. 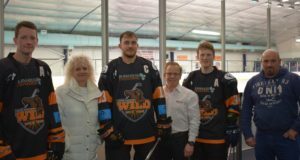 Before Saturday nights Robertson Cup match The North Ayrshire Wild welcomed some their new Black Jersey Sponsors to the rink. The jersey’s look stunning and even better when in action. We also had collection tins in the rink for The Wild’s chosen charity of the year. The Butterfly Trust – Cystic Fibrosis support for Scotland. These will a regular feature at our Wild games and we encourage all supporters home and away to give generously to help them continue and spread knowledge of the great work the charity does.